The Wild Rogue is a regulated use river with Noncommercial Permits required for floating between Grave Creek and Foster Bar from May 15 through October 15. Noncommercial Float Permits cost $10.00 per person, per trip. 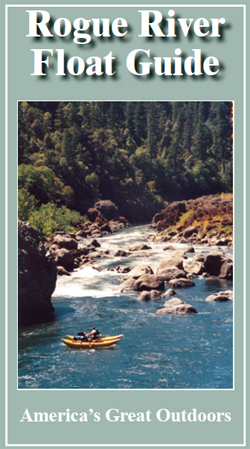 There are several ways to obtain a Noncommercial Permit to float the Wild Rogue River during the “regulated use” season. Special Note: 2017 is the first year that the Rogue River non-commercial lottery is taking place on www.Recreation.gov. If you are unsuccessful in the lottery, you may still pick up open float spaces on a first-come, first-serve basis. After the lottery process, there are still float spaces available. These available spaces are given away over the phone the first five business days in April. Throughout the permit season, beginning May 5th, cancellations received at the Smullin Visitor Center at Rand are given out by phone the morning following the cancellation. Confirmations may show fewer people on the permit than were allocated through the lottery. Those spaces will also be given out over the phone the morning after they are received. These openings may occur at any time. Keep checking for open dates. Permit holders are required to confirm no later than 10 days before, but not including, their launch date that they intend to use their permit. If the confirmations are not received by the Smullin Visitor Center at Rand by 3 p.m. on that date, the permit(s) will be cancelled and the spaces given away by phone the following day. To determine when you should call for a certain date, simply count back 9 days from your preferred launch date, starting with the day before your launch date as Day #1. Although openings can occur at any time, this is the most likely way to obtain a permit. Those who have successfully made reservations are subject to the Conditions of Use listed on the back of the permit. Additionally, if your trip was reserved more than three weeks prior to the launch date, a confirmation letter is sent to the party leader with information regarding check-in procedures, river use guidelines, and other important reminders. If reserved within three weeks of the launch date, a letter will not be sent; however, information is distributed by phone at the time reservations are made and is also contained in the links provided above. As a last resort, it is also possible to obtain a float opening from No-Shows and as a result of cancellations on the day before launch. No-shows happen when a party fails to pick up their permit on their launch date or a party shows up with fewer people in their party than listed on their permit. Day before cancellations occur before 3 p.m. on the day prior to launch, and are published on the website. These float openings are given out in the following manner: first to those signed up on the waitlist and in person at the Rand Visitor Center on the actual launch date at 7 a.m., and second to those persons who telephone us on the actual launch date beginning at 8 a.m. Parties receiving no-show permits must launch their trips on that same day. The waitlist is maintained at the Rand Visitor Center. You must physically be present to sign up on the waitlist, and you can sign up 24 hours a day, 7 days a week. Although you can sign up on the waitlist as many days in advance of your preferred launch date as you wish, you must also check in every single day at 7 a.m. leading up to the day of launch to maintain your position on the waitlist. Off-season Permits are also available in front of the Smullin Visitor Center or at the north end of the Grave Creek Bridge. Fire pans and portable toilets are required for all boaters.